This is what would happen under the Whitefish Range Partnership Agreement and the Flathead is proposing to similarly increase logging areas (the suitable timber base) forest-wide. F.H. 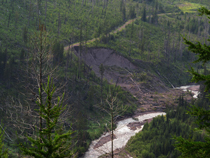 Stoltze Lumber Company, a Whitefish Range partner, sued the Flathead in 1976 when it tried to decrease its suitable timber base to better protect water quality and because “taxpayers couldn’t afford road building costs necessary to cut old growth” that extensively! And now it has partners Montana Wilderness Association and Headwaters Montana saying “all parts of the [Whitefish Range Partnership] Agreement must move forward together,” which is otherwise known as horse trading! Fish, wildlife and people cannot afford to have the Flathead’s suitable timber base inflated once again and they need more than a handful of roadless lands protected as wilderness!